I recently saw The Hunchback of Notre Dame at Aurora Theatre, one of my favorites. Everything I've seen at Aurora has been fantastic, but this show is beyond spectacular! With a star-studded cast, beautiful music, and an indelible set, this show is poised for fanfare of the sort that lasts for decades! 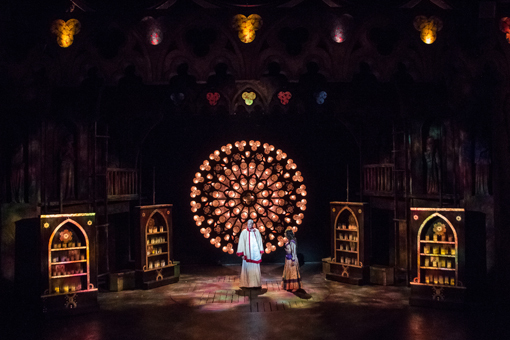 The Hunchback of Notre Dame is a co-production with Theatrical Outfit—the first show in its 2017-2018 season—where it is now running through Sunday, September 17. 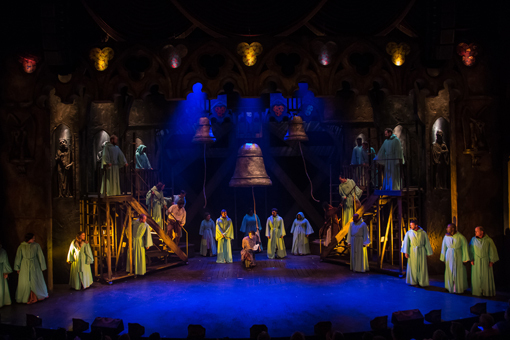 I'd never seen The Hunchback of Notre Dame, so I didn't know the story or what to expect, beyond knowing it would be an amazing performance because it was at Aurora. Between seeing The Hunchback of Notre Dame at Aurora Theatre and Theatrical Outfit, I've watched the 1996 Disney animated version and the 1939 black and white Hollywood movie starring a young, new actress Maureen O'Hara. There's also a 1923 film version that I did not see. All are based on the novel written by Victor Hugo, but none exactingly follow the book. The Aurora Theatre/Theatrical Outfit co-production is an amalgamation of the various previously performed renditions. It doesn't have the happy ending that Disney gave it, but you won't be sorry you saw this perfectly performed work of art! Haden Rider (Quasimodo) is phenomenal! A young, humble actor, his talent is eons beyond his years. As Quasimodo, he is wholly convincing as an innocent, "different" (caged hunchback), and compassionate human being. Theatre in Atlanta is the best it has ever been, in my humble opinion. I've seen amazing theatre throughout the years in Atlanta, as far back as 1987. We had great talent then, but now we have so much more! If there were a First Lady of Atlanta theatre, Julissa Sabino (Esmeralda) would be a strong contender. She's beyond amazing and is so incredibly talented. I've had the great pleasure of seeing her in a number of plays in recent years (The Toxic Avenger, Grease) and have had the awesome pleasure of meeting her. Charming, poised, grateful...she possesses all the best qualities one would hope a celebrity would have. 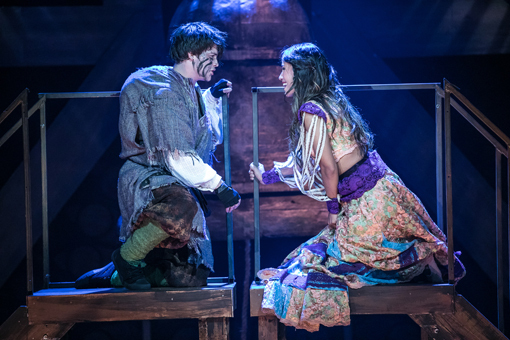 From being a champion for her people's human rights, the Gypsies, to demonstrating genuine compassion, for Quasimodo, Julissa's performance shines brightly in this tale peppered with darkness. Julissa is also the Dance Captain for this production, which she totally rocks! The multi-talented David de Vries, who has performed in top grossing stage, television and movie projects, plays Dom Claude Frollo, a character I detested from the very first promotional images I saw. The character is creepy! That's also to say that David's performance is brilliant. He brings to the stage one of those characters that you love to hate. A character that stirs uneasiness deep down in your soul. I was so conflicted wanting to see Frollo crushed and totally wanting to meet de Vries! This show has a powerful cast, including Kevin Harry and Lowrey Brown, as well as a phenomenal ensemble. And the puppeteers are magical! They bring the gargoyles to life and lighten the dialogue—conversations with Quasimodo—with some wonderful humor. I went to see The Hunchback of Notre Dame at Aurora Theatre with my friend Barry, and we already have tickets to see it again at Theatrical Outfit! Barry visited Paris a few years back and made some stunning photos of the Notre Dame Cathedral, this one of the bell tower side we see in the show. He thoroughly enjoyed the musical and I'm sure the spectacular sets whisked him right back to Paris. 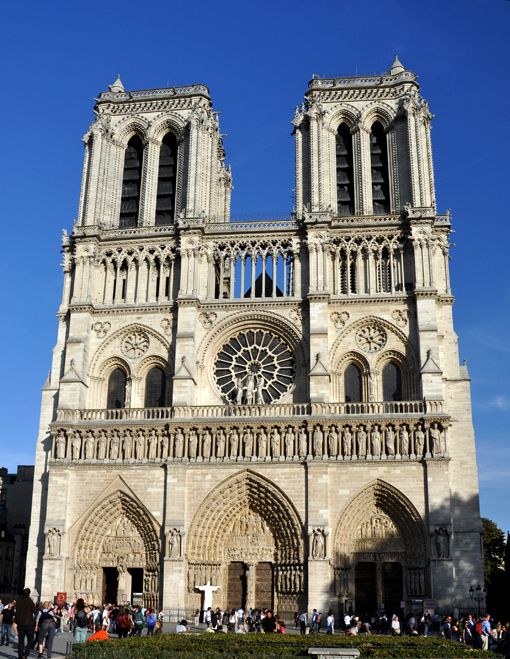 Go see The Hunchback of Notre Dame and be whisked away to Paris yourself! 15th Century Paris, that is. And be prepared for one of the most incredibly heart-wrenching, heart-touching stories you've ever seen.